It is raining and damp on Windy Bay today. The lake is still and apart from the odd shot fired now and again, we hear almost nothing, save the delicious sound of raindrops falling on a metal roof. After a long walk and discussion about driving to town to see a movie, we opted, as we so often do, for a cozy afternoon with our books. My goal was to finish this month’s selection for The Best Food Ever Book Club. If we had first come to see Elena Greco and Lila Cerullo, the two main characters of Elena Ferrante’s My Brilliant Friend, as young women, it would have been our loss. By describing the friendship of two little girls with all of its inherent passion and intensity we, as readers, never lose sight of those children. This device, whether intentional or not, gives the book much of its power. Set in a poor neighborhood on the outskirts of Naples, we learn of a society struggling to cope with post-war conditions in Italy. As the girls observe events in the neighborhood, we see the volatile and frightening conditions in which they live. Girls are neither highly valued nor are kept very safe. It is this anxiety that creates a never-ending tension in the book. As in most tales of girlhood friendship, there is a divergence in their respected paths. One will be continuing her education, and the other will have to work in the family shoe repair shop. As fate would have it, the girl with the greatest ability is the one who is stymied. Knowing the rivalries, the competition and the gut- wrenching power these emotions have with both girls, the split is painful to imagine. Perhaps readers with a memory of such times and similar decisions made regarding the fate of sisters and neighbors, feel this more keenly. I will wait until the Best Food Ever Book Club discusses this work to see if anyone agrees with me. Perhaps I will share a personal story. It happened in a similar fashion. Sent to a private school, and then to compound matters, moving to a new house, drove a wedge between my best friend from childhood and me. She went on to new friends as did I, and we were not able to maintain our former bond. Even if the parting of the ways had not been centered around school, I was reminded of other factors that seem to break those incredible ties of friendship one feels in elementary school, and how something along the way always seems to come between cherished friends. If it isn’t school, it is a boyfriend, or lack thereof, or some change that often splits them apart. After reading L.M. 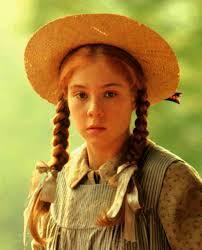 Montgomery’s Anne of Green Gables so many times over, and at least once per decade throughout the course of my life, my last go-round brought me to the understanding of the diverging paths between Anne and her friend Diana. With mouths to feed and a farm to run, Diana’s father decrees that she will not go on to further her education while Anne receives a scholarship. There is no remedy, no matter what the intention. Neither girl will be the same. Elena Ferrante does a brilliant job of zeroing in on the truth of these girl’s circumstances. Neither one is safe. Not entirely, and the women who should be protecting them seem unobservant, distant, and oblivious. For how many centuries were girls and women told to accept their lot in life without complaint. For how long did we have the merest of choices over our destinies? While I would not call My Brilliant Friend a feminist novel, it certainly stirred those emotions. 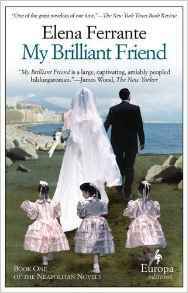 My Brilliant Friend is the first in a series of four books. Whether I continue, or leave off here remains in the hands of my book club. Knowing some have already galloped on through, I expect to hear some heavy lobbying. This entry was posted in fiction and tagged Anne of Green Gables, Elena Ferrante, Friendship, L.M. Montgomery on November 9, 2015 by Elizabeth Smythe Brinton.